In this blog post, I would like to go through the RFQ Requirement field in the Purchase requisition line. RFQ requirement field works in conjunction with Purchase requisition RFQ rule that can be configured in the Procurement and sourcing > Setup > Policies > Purchasing policies. When the purchase requisition line is being created, the system will determine whether it’s formal, informal or none based on the Purchasing policies. Automatic identification of the RFQ requirement field might be ill-understood. 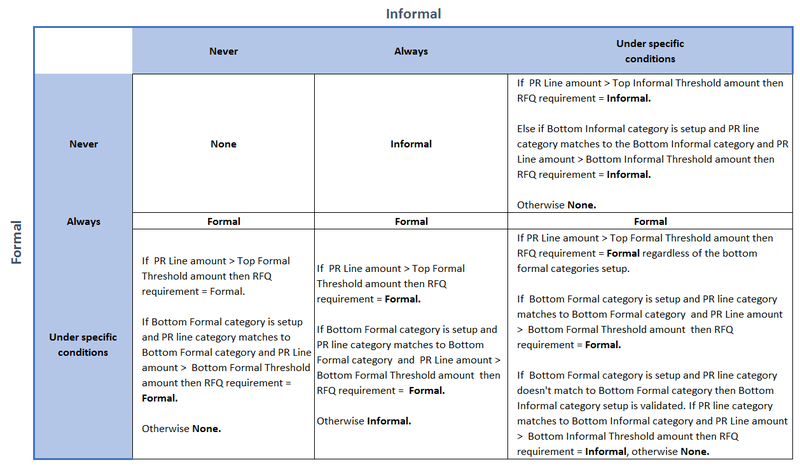 So, I would like to bring to the table the matrix that I have prepared to get an idea of the identification Formal, Informal or None values. Let’s clarify the terminology that I used in the Matrix. Presumably, this matrix will be beneficial for users who are struggling with this field. Open Procurement and sourcing > Setup > Policies > Purchasing policies. 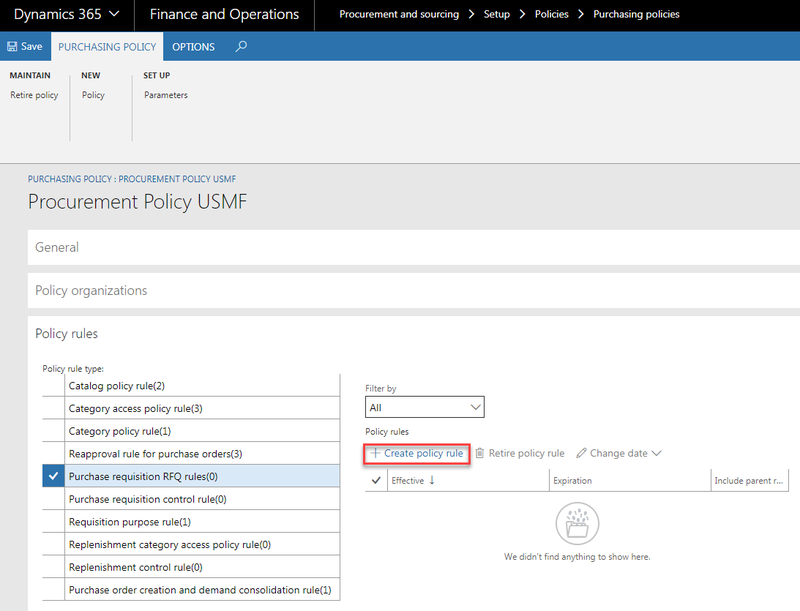 On the Purchasing policies list page, either select and double-click an existing purchasing policy, or click Edit in the Maintain group of the Action Pane. 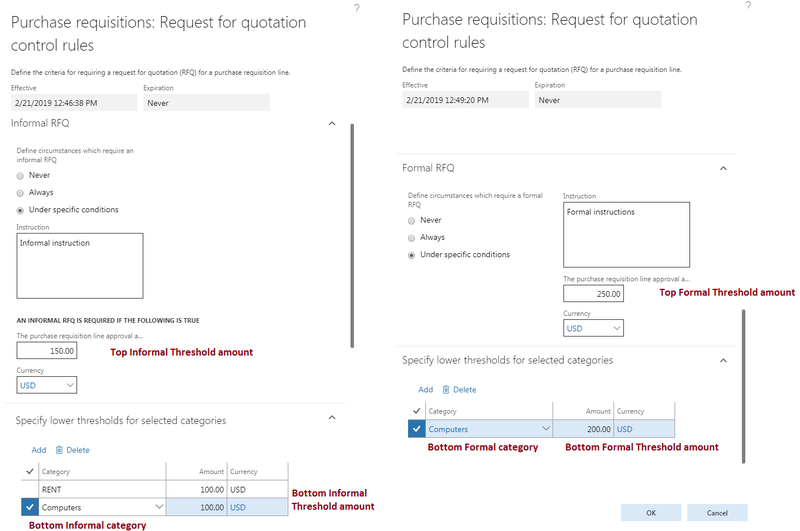 In the Purchasing policy form on the Policy rules tab, select the Purchase requisition RFQ rule from the Policy rule type list, and then click Create policy rule. Enter the Effective date and the Expiration date. Select an option in the Informal RFQs FastTab. Select an option in the Formal RFQs FastTab. Open Procurement and sourcing > Purchase requisitions > All purchase requisitions. Create a new purchase requisition. Create new lines. Once you save the line or update the quantity/price, RFQ Requirement field will be filled in. Bear in mind that Purchase requisition RFQ policy rule enables you the ability to setup a HelpText for the RFQ requirement field. RFQ requirement indicates whether suggest vendors functionality is enabled. If RFQ requirement of the Purchase requisition line is Formal, Suggest vendors functionality will be enabled. However, Suggest vendors functionality is also enabled when Purchase requisition line type is Category. 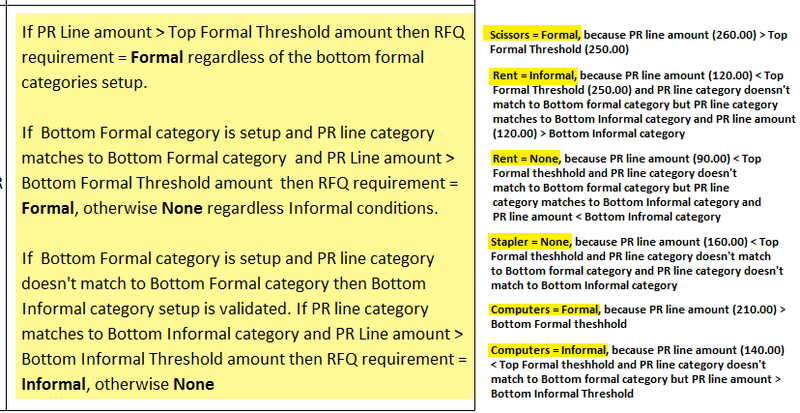 I hope that after reviewing this matrix, you will have a reasonably good general understanding of what the logic for the writing in of the RFQ requirement field is and will bridge all the gaps in examining of this feature.